The monitoring alarm system solution is in order to solve the illegal personnel implement theft, robbery and other acts on the bank ATM to ensure that the bank ATM is not affected by illegal actions. 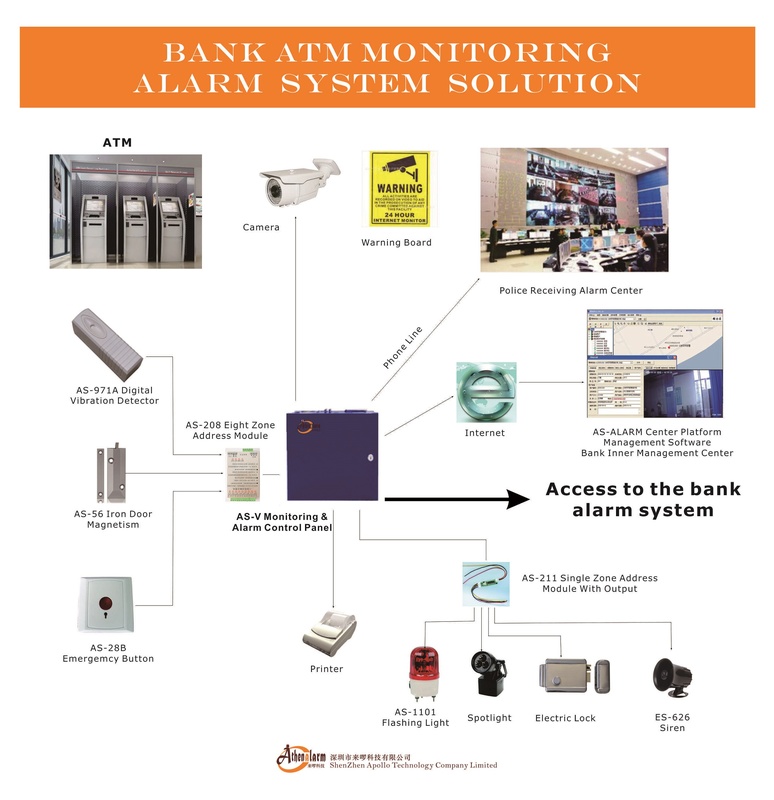 It can inform the police and bank security personnel through monitoring alarm system based on the AS-9000 series alarm control host, and give illegal personnel effective deterrence through the scene of sound and light alarm to ensure the bank ATM security. It can monitoring the site of installed ATM and nearby, review the video at any time, store the video surveillance data cyclically, when the illegal events occur, it can provide relevant data to the police to find out criminals. 2.2.1 The monitoring alarm system solution includes pre-prevention, handling and post-retrospective three aspects of ATM anti-theft, anti-robbery and other illegal actions. 2.2.2.5 Install the cameras in the corner, entrance and other key locations of the ATM region, monitor the entire ATM region 7 * 24 hours continuously, so that illegal personnel can’t make an illegal action. 2.2.2.6 The bank notice the bank burglar alarm system (including ATM) for a brief introduction through the bank's internal video system or post it, so that the illegal personnel can quit before action. 2.2.3.5 When the detector is triggered, the sound and light alarm equipment with the linkage, sending alarm, so that the illegal personnel feel effective deterrence, immediately give up the illegal action. 2.2.3.6 The NVR module in AS-V Monitoring & Alarm Control Panel has an alarm function that report to the police immediately when the camera is blocked or the image is lost. 2.2.3.7 When bank security personnel receive a variety of alarm signal, they can view the video that the alarm sending through the alarm software (AS-ALARM Center Platform Management Software), and deal with the event immediately. 2.2.3.8 The ATM camera record 7 * 24 hours continuously of the ATM region, and save the video data in the hard disk. 2.2.3.9 Bank personnel can view the video at any time, master the real-time bank security dynamics, and review the past video data at any time, if something is abnormal, they can deal with it immediately. 2.2.4.1 If the illegal action occur, banks and police can call and analysis store hard disk video data to find criminals. 2.2.4.2 To research the entire criminal process of criminals, find the best way to prevent to prevent the recurrence of such incidents and deal with it properly. The host have test program, it can be able to diagnose where error occurred (the wire, the detector or the host itself). The host chassis 24 hours anti-tamper, telephone line anti-cut, anti-short circuit, the host automatically grab wire alarm when alarm happen, AC power off alarm, battery loss, low voltage alarm. NVR alarm type: motion detect, video blind, video loss, abnormality the users can watch the live video at any time whether alarm is triggered. It has a high compatibility, can access the original analog system DVR equipment and IP camera. It receive IP camera and other equipment digital video stream, transmit it through the network, and store, manage digital video data to achieve the advantages of distributed architecture brought from network. It's easy to set up and simple for management. The users can watch, browse, review, manage, store multiple IP cameras at the same time, and it can provide on-site video evidence to police. In addition, the video in the network transmission efficiency is high. AS-971 digital vibration detector adopts the international advanced photoelectric vibration sensing principle, combining the vibration sensor and vibration analyzer, with the CPU processing technology, induces the degree of vibration damage through the vibration of the sound source wavelength and frequency. It is applicable to various models ATM automatic teller machines, vaults and different sizes of safe and other equipment to detect, effectively prevent hit, drill, pry and other destructive behavior on the equipment. It has been used for the major banks ATM automatic teller machines and other equipment. It is often used in the alarm equipment. When someone open the shell, it will give alarm signal to the alarm host. The alarm center is the core of the monitoring alarm system, composed of computer (preferably with uninterruptible power supply) and central platform management software. Central platform management software receive the alarm signal from the host through the computer, and the computer call the database information, display the time of the incident, location, category, name, telephone and the on-site plan on the electronic map. In order to ensure handling alarm information timely and correctly, and the equipment can run for a long time without interruption, the central platform management software can easily see the status of each alarm control host, as well as the status of each zone. Operation is also very convenient, select the host or zone, right-click to accomplish arm, disarm operation. When any zone appears alarm, the software will immediately display the detailed information of the alarm location, and can directly view the video surveillance camera. Compatible with popular communication protocols such as CSFK, Ademco Contact ID, Ademco 4 + 2 express, etc. Powerful statistical reporting functions, comprehensive conditions query and print the required data reports are very convenient, such as user information, event reports, system logs and handing report, etc. When someone go in or out of the door, it play voice "welcome".